Anonymous Park, also known as The Moab Bike Park is a BMX dirt bike park on the west side of 500 West on the west side of Moab (Colorado River side of town, not the La Sals Mountains side of town.) Named after an Anonymous donor, it’s an asset to the community. Definitely plan to spend a couple hours here. On the west side of Moab, Utah's Anonymous Park, also known as The Moab Bike Park, is a BMX dirt bike park. The land was donated anonymously, thus, the park’s name. All ages and levels of bikers hang out at the park and enjoy this uber fun, somewhat tree covered BMX Park. There is plenty of room for adults to watch/chaperon from the parking lot or the along the south end of the dirt bike park. Anonymous Park was built by the Moab Bike Park Committee through the Moab Trail Alliance. Helmets are a must and appropriate padding is encouraged. This area is not supervised. It is for non-motorized vehicles only. All riders must travel in the one-way direction indicated. A strict list of prohibited activity is posted- Abusive and aggressive behavior, profane or foul language, amplified music, motorized vehicles, smoking, drinking alcohol or doing drugs. Don’t spoil it folks! The kids playing there are some of the most polite youngsters around. The site is available for organized events but must be approved by Moab City. This is an all levels park… well, all levels on a Moab scale. Kids from knee high to six feet tall are seen playing there, encouraging each other and egging each other on. 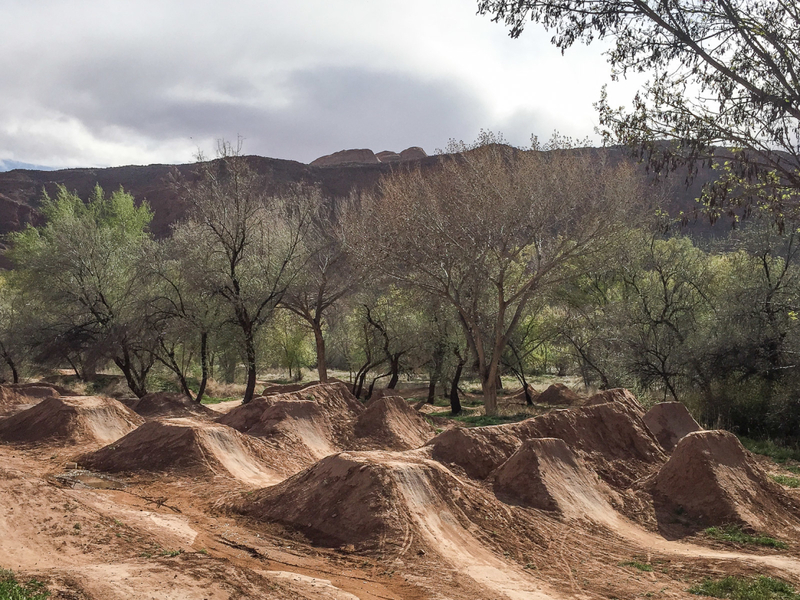 It’s a dirt park on a Moab play scale of greatness. The Park is across the street from Moab’s hospital on Williams Way (500 West) on the north side of town. There is a parking lot available and there are no fees for use of the park.